Thinking about making Valentine’s Day reservations soon? If you are Catholic and under the age of 60 you might want to look for seafood or vegetarian fare. This year, Valentine’s Day shares the calendar with Ash Wednesday. This hasn’t happened since 1945 (…but it will happen again in 2024 and 2029). That means it is an obligatory day of fasting (one full meal plus two smaller meals that together are not larger than the full meal) and abstinence (no meat). Also, expect some non-Catholics in the restaurant to think you and your date have dirt on your heads. There are actually three different stories of martyrs named Valentine (not a lucky name apparently…) that share a February 14 feast day. As the Catholic Education Center notes, “Unfortunately, the historical record is sparse.” In 1969, the Catholic Church removed Saint Valentine’s feast from the liturgical calendar. Yet, he (all three) remains a saint. 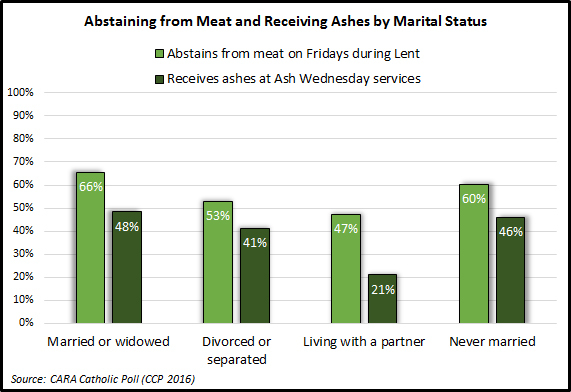 According to a CARA Catholic Poll (CCP), married and widowed Catholics are the most likely to abstain from meat during times of Lent (66%) and are also more likely than those of other marital statuses to receive ashes on Ash Wednesday (48%). Those least likely to be bothered by an Ash Wednesday Valentine’s Day? Perhaps those Catholics who are living with a partner. Only 47% abstains from meat and 21% receives ashes. Yet, we know this standard marital status question is not as precise as it could be. One could be living with a partner and choose to identify as “never married” and they would be answering the question honestly. 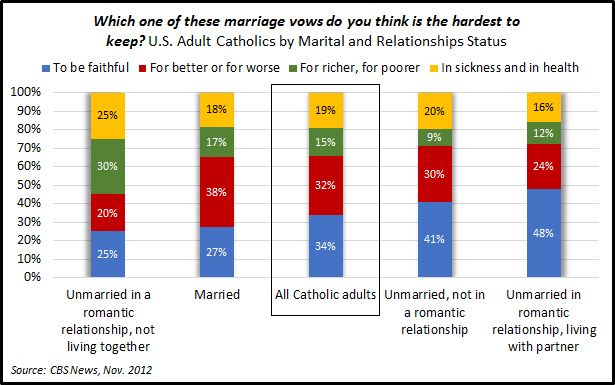 A 2012 CBS news poll allows us to more distinctly estimate different sub-groups of unmarried Catholics. 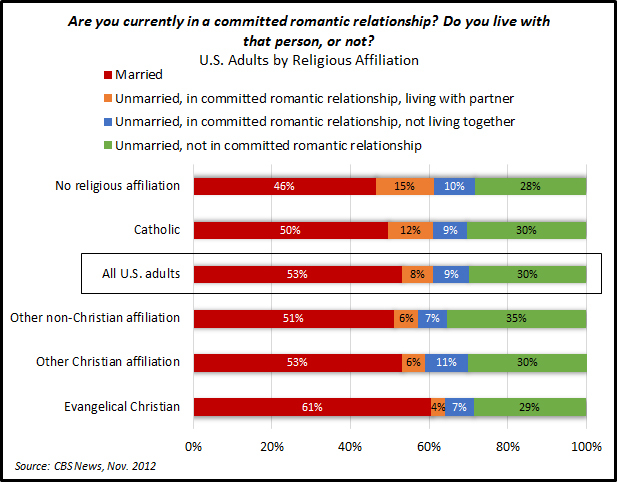 As shown below, half of Catholics are married and 30% are unmarried and not in a committed romantic relationship. Twelve percent are in a committed romantic relationship and are living with their partner. Nine percent are in a committed romantic relationship and are not living together. Sub-group sample sizes are worryingly small but comparisons among these groups offer a blurry glimpse of some interesting differences. Overall, about two-thirds of Catholic adults believe in “love at first sight” (…shot by an arrow from a cherub and not from any of the Valentines who are not thought to have been archers). 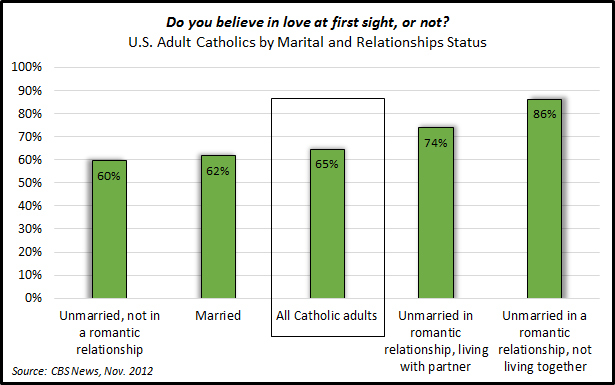 By contrast, about three quarters or more of Catholics who are unmarried but in a romantic relationship believe in love at first sight. Only six in ten of those who are unmarried and not in a romantic relationship agree. It has become common to debate the secularization of Christmas. It is hard to find anything sacred in what remains in the practice of Saint Valentine’s Day in the United States. Perhaps this is why many Catholics will find more sacred meanings on February 14 this year in Ash Wednesday than Valentine’s Day. Just to be safe you still better get your significant other a card and some chocolates (to eat on Feb. 15). If you want to look forward to something truly unique about Ash Wednesday you’ll have to wait until (live to) 2096 when it will occur on February 29 for the first time in the Church’s history. Luckily, this is very unlikely to conflict with any of the traditions Americans will have at that time for celebrating Leap Day. 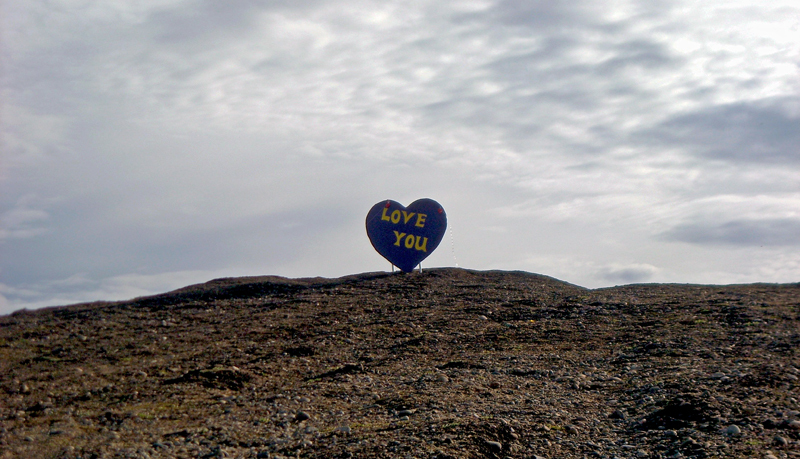 Image of the ash heap Valentine courtesy of Lester Luallin.